Have you heard of Hydrocera triflora? I hadn't until just recently. To my surprise, Hydocera is one of only two genera that make up the family Balsaminaceae. What's more, it is a monotypic genus, with this lovely species being the single representative. There is no question that H. triflora has been completely overshadowed by its cousins, the Impatiens. In fact, literature on this species is quite scant across the board. The first question you may be asking is what differentiates Hydrocera from the Impatiens? The differences are rather subtle. I don't know if I would have considered this plant unique enough to warrant its own genus, however, closer botanical observations tell a more nuanced story. The biggest differences between Hydrocera and Impatiens has to do with flower and fruit morphology. For starters, the flowers of Hydrocera consist of a full compliment of 5 sepals and 5 petals. The petals themselves are all free from one another. Contrast this with Impatiens, whose flowers mostly consist of 3 sepals and 4 petals that are fused into pairs. The second major difference lies in the fruits. Many of us will be familiar with the explosive capsules of the various Impatiens species, each of which contains many seeds. Hydrocera on the other hand, produces berries that contain 5 seeds. Such vastly different developmental pathways in reproductive structures appear to be enough to warrant the taxonomic separation between the two genera. The next question one might asking is why are Impatiens so diverse while Hydrocera contains only a single species? This is anyone's guess, really, but there has been at least a few hypotheses put forward that sound plausible. One has to do with habitat preference. Impatiens are largely plants of upland forests and montane environments. Such habitats may offer more potential for diversification due to high heterogeneity in resources and lots of potential for isolation of various populations. Contrast this with the habitat of H. triflora. Though it occurs throughout a wide swath of lowland Asia and India, it is semi-aquatic and these types of habitats may be more restrictive for diversification. Another possibility has to do with seed dispersal. As mentioned above, Impatiens produce lots of seeds per capsule and, with their explosive habit, can disperse them over relatively large distances. Contrast this with Hydrocera. When the berries mature, they fall into the water and sink. They remain submerged until rot or various aquatic organisms eat away at the fleshy coating. Once the seeds have been freed, air sacs cause them to float on the currents until seasonal drying brings them back into contact with the mud. Though this is certainly an effective method for dispersal, the lower seed production rate coupled with being at the mercy of the currents means that Hydrocera is probably considerably less likely to find itself in new habitats. Again, this is largely speculation at this point. 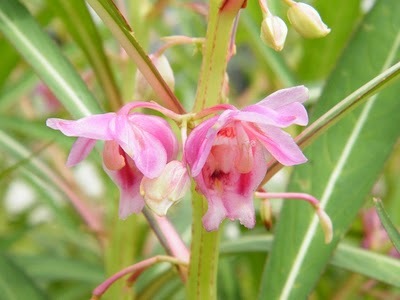 We simply don't know enough about this oddball of the balsam world to make any serious conclusions. Luckily H. triflora is not a species under immediate threat. It seems to do quite well throughout its range, frequently occurring in flooded ditches and rice patties. Still, such stories underlie the importance of fostering and funding organism-focused research.